I got sent a fantastic link via Twitter this morning. It was to a photograph taken in 1965 of the State building on Kilburn High Road. The photograph is interesting, but the history site that it’s part of turned out to be a treasure trove. Click on any of the seven photos of Kilburn taken around the same time, and you’ll find a few dozen comments from people who grew up in the area. It takes a bit of diving into the site to find all of them – some are comments to the initial memories, and so on. They paint a picture of post-war Kilburn that in many ways we could recognise today: a lively, bustling, rough-around-the-edges neighbourhood that people generally have an affection for, with characters such as Biff Lewis (who of course gets into a fight) and Susan the Swedish employee at Woolworths. Naturally there are also some big changes – not least in the number of cinemas. One person recounts four different ones: the Ionic, the Grange, the Essoldo and of course the State. Thanks to Jon Kelly for the original link. Look out for an architecture competition on the blog in the next day or so. 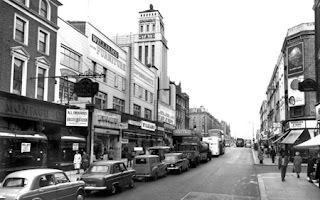 And if you want to read about some West Hampstead history, check out this post about how our part of London fared during the Second World War. Update 4.30pm, 20th Century London sent me a link to some more great old photos of Kilburn including one of the Rolling Stones backstage at the Gaumont State.